There were numerous flood warnings in England and Scotland yesterday due to storm Erik which also brought winds of up to 70mph in some parts of the UK. While most of the south will be covered by a temporary band of wet weather today, there will be some snow in the higher parts of Wales and the Peak District. As this morning progresses, however, the rain and cloud cover will head towards Scandinavia although, for most areas in the south, it will still be a wet start to the day. Met Office Meteorologist Steven Keates said: “For many northern areas of the UK, showers will generally tend to fade away. Mr Keates also added that when the skies do clear temperatures will fall below freezing with temperatures in Scotland being the coldest in the UK with widespread frost expected. Further south, the rain and wind will drop with temperatures settling around their seasonal average. Mr Keates did warn, however, that as the band of wet weather moves away from the south as the morning progresses that there could be “some snow on its back edge”. Some of the best weather on Sunday afternoon will be in southern and eastern Scotland. For Northern Ireland, unfortunately, a heavy band of weather will bring quite a “wet day across the province”. 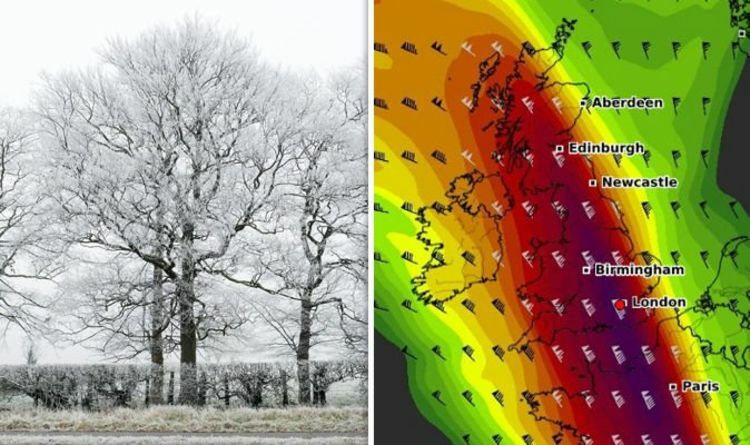 READ MORE: Ireland weather forecast: When will Storm Erik hit Ireland? Temperatures for most of the UK will settle between 6-8C but as we move into the evening, the band of wet weather will move from Northern Ireland and across the south of England. Mr Keates added the band of weather will potentially have “some hill snow” as it makes it way out of Northern Ireland and into Wales and the south-east of England to end Sunday. Behind that weather front, winds will drop and it will be much clearer in the early parts of Monday morning but that does mean it will be much colder. Most areas of the UK will hover around freezing with “quite a widespread” frost on Monday morning as we move into a week of drier but at times colder weather.